Deepeeka of India are known for their cheap swords. Some are okay for the money, some not worth even worth bothering with and occasionally - a real jewel in the junk.. Which category does the their Pompeii Gladius fall into? Read the review and decide for yourself..! I’ve been after a short style sword to add to my collection for a while, and being particularly interested in the Roman era, wanted to test out some Roman swords. So I set my mind to finding a decent gladius that was at least capable of cutting a few of the milk bottles gathering in the garden. I was determined to buy either the Gen2 Mainz or the VA Praetorian, but I couldn’t wait until my next payday any longer and decided to test out a cheaper alternative. Historically the Pompeii style gladius was a culmination of a change in battle tactics adopted by the Roman legions, plus it was much easier to make than the previous leaf style blade. Although the Pompeii gladius could cut quite well the cut was not emphasized as much as the thrust, which must of worked better in tight formations. This Deepeeka gladius is without doubt a very accurate reproduction, possibly the most accurate gladius you can buy in this price range, plus it’s rather good looking in a simplistic kind of way! The sword took just a day to arrive at my door and was extremely well packaged. After removing all of the plastic wrapping I finally got my first view of the sword and even when the blade was covered in thick gunk it truly was a nice looking item. The first thing I noticed was just how heavy this thing was. It weighed in at just over 2lbs, with the point of balance being concentrated almost entirely towards the tip of the blade at 5 inches from the guard. I haven’t handled any other reproduction gladius to compare the weight but I have handled an authentic antique gladius, and even though it was just the blade without the handle or guard, it did seem a lot lighter than this Deepeeka version! The sword felt solid with no signs of looseness or rattling. Being Deepeeka’s updated version of the previous Pompeii, this one boasts a full thick rectangular tang that is part of the blade and definitely not welded to it like some Deepeeka swords. 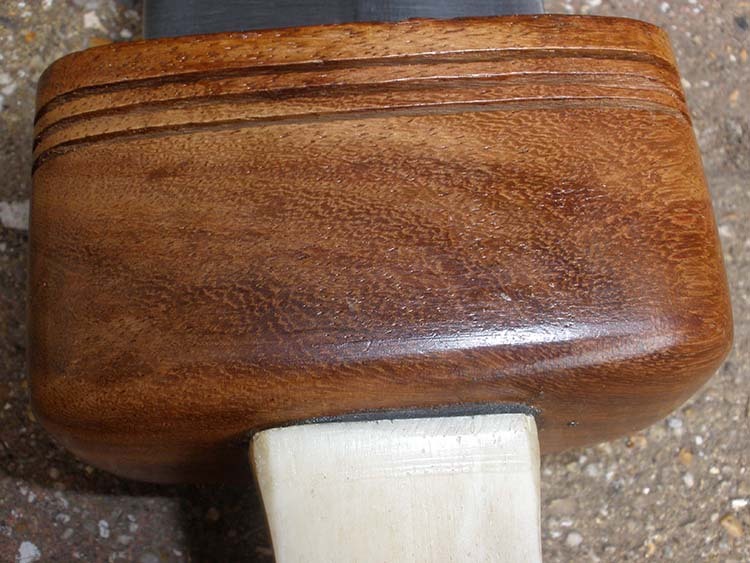 I would love to prove this but the guard and pommel seem to be glued to the bone handle, which I guess makes it a little bit sturdier, but also a pain to remove and put back together again.I am also quite sure that it is a threaded tang as there is no indication of it being peened. 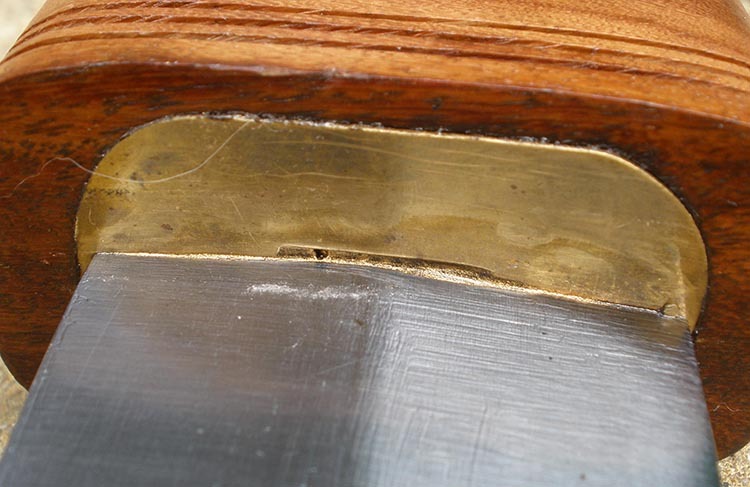 Looking at the inset brass guard plate you can just about make out the width of the tang entering the handle and it looks adequately large. A small annoyance was the scabbard. Whilst it is historically accurate and rather nice to look at, it really takes some effort to sheath the blade, as the mouth of the scabbard seems just a little too small, but this is only a minor nuisance and probably attributed to just this particular sword. Holding the sword, you really can start to understand why the Romans favoured it over longer swords. It’s a basic design but hugely effective at close quarters and amazingly quick at striking. Now this is where it goes a little bit downhill. 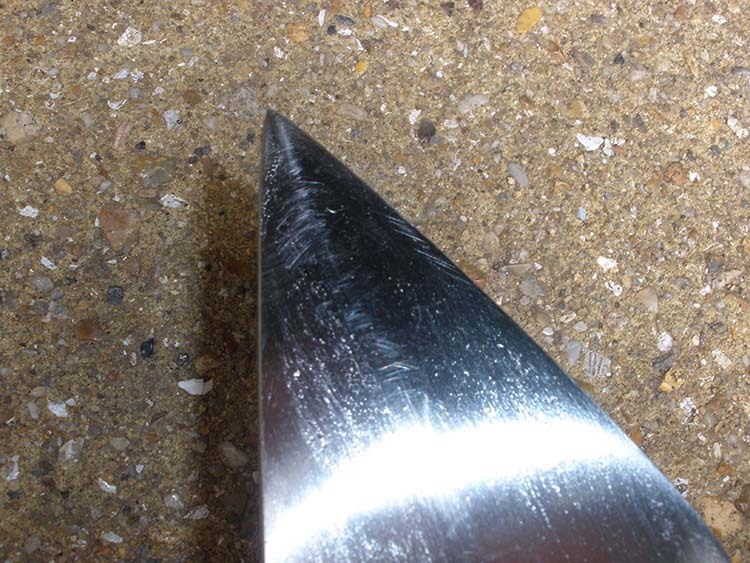 Whilst testing the flex of the steel, the blade did kind of bend out of shape. Although it was only a tiny fraction as the blade is very stiff, it was enough to make me wonder why I didn’t pay much attention to all the nice people who have talked about Deepeeka’s lower quality steel. It also seems that they forgot to polish part of the blade as you can see in the photo. Strangely though, my research has revealed that gladii were made almost entirely of low carbon steel, all except higher ranks such as centurions and legatus etc, who often had their swords made specifically for them and to a much higher quality. The truth is that although this sword would not stand up to steel on steel, it would work very well for sword on shield, which is just how the ancients fought. So maybe the softer steel just adds to the historical accuracy, or at least that’s what I keep telling myself. Handle is made of bone (proper bone, not plastic that looks like bone!) and is completely square apart from the finger ridges. This makes it ideal for stabbing, which it does very well, but is a bit uncomfortable when the sword is swung. If you are looking at doing a lot of cutting with this sword, I would definitely recommend either filing the handle to a more oval shape or replacing it with something less painful on the hands. The guard is nicely made out of hardwood with an inset brass plate which is historically accurate. Also made from hardwood and completely spherical. The original (left) and Deepeeka's attempt to copy it. 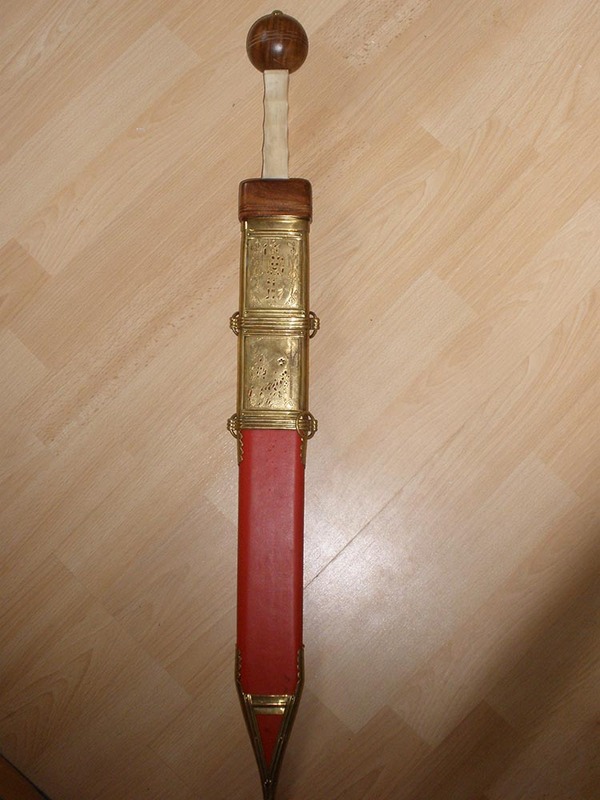 Not bad overall..
A very nice wooden scabbard with brass decorations on nicely stitched red leather. Very attractive as you would expect from Deepeeka but the sword doesn’t fit comfortably. 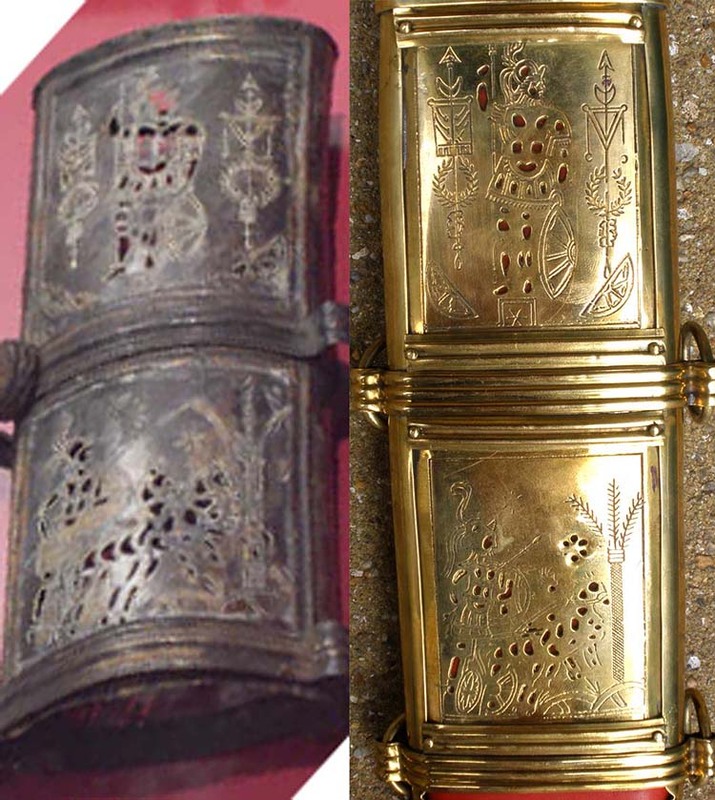 The brass decorations are copied from archaeological finds from an original gladius. P.O.B : 5” from guard. Handle: 4.5” / 9.2 with pommel and guard. As far as the handling characteristics go, as a stabbing weapon this sword handles beautifully, it’s very quick and the weight towards the tip improves the power of the thrusts. As a slashing weapon it is a little bit rather clumsy given the square nature of the handle, which tends to dig into your hands. You may think that this is a bad thing but remember that the Pompeii gladius was only really used for stabbing, and whilst it could cut, it wasn’t designed to be a cutting weapon. Right I’ve rambled on too much, time to cut some things. As the sword arrived completely blunt, the first task was to sharpen it. I have no patience to sharpen swords the ‘proper’ way, so I entrusted the job to the trusty Accusharp. Even so it still took about half an hour to get a decent edge. I was very surprised that it cut as well as it did, as I was expecting to just be launching bottles everywhere. It cut through milk bottles relatively easily and afterwards showed no signs of looseness or damage to the blade, I was impressed! I am quite impressed with this gladius and find it very good value for money. It is undoubtedly very solidly made. I have been cutting light targets with this gladius for over a month now and there is still no sign of looseness or damage. Of course there is room for improvement. The blade is not made from the best steel, and probably wouldn’t hold up to lots of cutting (milk bottles or barbarians! ), and the handle should be rounded to provide a better grip instead of square. Also I have heard that Deepeeka swords can differ in quality from sword to sword, and I do not own another one to find out. Most historically accurate gladius around. Not all that many places sell Deepeeka Swords - but the best place to pick up the Deepeeka Pompeii Gladius is here at Kult of Athena where they are available for $149.95 (normal retail price elsewhere is around $200).